By Janina Scarlet Ph. D.
Have you read and reread the “Harry Potter” books? Are you someone who can quote the movies by heart? Do you still ever wonder when you will get your acceptance letter into Hogwarts School of Witchcraft and Wizardry? As a diehard and proud Potterhead, my heart warms every time I hear the main theme music, “Hedwig’s theme.” Like many of you, I have been sorted on Pottermore (House Slytherin) and I have my wand (Willow, 10-inch unicorn hair) and robes. And for me, like for so many of you, the “Harry Potter” series has been life changing. I always wanted to write a book specific to Harry Potter, my favorite fandom, and one, which undoubtedly has influenced me, the most. I decided that I would like to write a self-help book for you, my fellow Harry Potter fans to help you better manage you anxiety, depression, trauma, insecurity, and other difficulties. I hope that you will join me on an enchanting exploration how “Harry Potter” series can help us heal and find the magic in our own lives. The proceeds of this book will be donated to mental health charities, such as Crisis Text Line and RAINN, as well as Lumos organization. Dr. Janina Scarlet is a Licensed Clinical Psychologist, a scientist, and a full-time geek. A Ukrainian-born refugee, she survived Chernobyl radiation and persecution. She immigrated to the United States at the age of 12 with her family and later, inspired by the X-Men, developed Superhero Therapy to help patients with anxiety, depression, and PTSD. She currently works at the Center for Stress and Anxiety Management in San Diego. 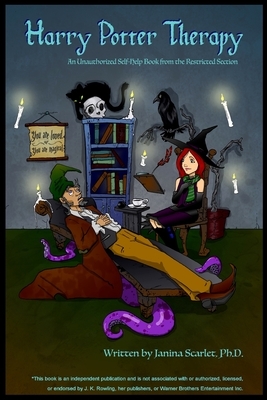 Dr. Scarlet’s books include: Superhero Therapy, Harry Potter Therapy, Therapy Quest, as well as numerous contributions to the Psych Geeks Books Series. Vincent Alvendia is a native of San Diego, California and does not plan to leave as long as San Diego Comic-Con International remains there. He does not like long walks on the beach because that time is better spent watching anime, reading comics, and rewatching Star Wars movies with his amazing wife and fellow geek, and his spawn of geeklings.